(A) A preoperative picture of our patient with severe obesity and the pressure curve during right heart catheter with a retreat from the right atrium to the femoral vein prior to bariatric surgery. (B) The same patient after bariatric surgery and weight loss of 65 kilograms, with the pressure curve after bariatric surgery. Obesity is a major public health problem, with a prevalence of 10% to 20% in Western Europe.1 It is a risk factor for arterial hypertension, atherosclerosis, and heart failure.2 In times of rising prevalence in obesity, bariatric surgery offers an effective way to achieve weight loss.2 The indication for bariatric surgery is provided by interdisciplinary specialists and applies for patients with a body mass index (BMI) >40 kg/m2 or a BMI >35 kg/m2with relevant comorbidities.3 Previous studies have shown that in late pregnancy, compression of the inferior vena cava can lead to hypotension and thrombosis. As previously published,4 there is a correlation between obesity and elevated pressure in the vena cava inferior simulating obesity-induced vena cava compression syndrome, potentially leading to venous congestion, thrombosis, and subsequent pulmonary embolism. It is unknown whether obesity-related vena cava compression is reversible after bariatric surgery. In February 2017, a 54-year-old male patient was referred to our hospital for further work-up of general weakness. Two years prior, this patient had been admitted because of dyspnea and heart failure signs, as well as leg edema suspicious for pulmonary embolism. He suffered from severe obesity, with a BMI of 46 kg/m2 (Figure, A). This patient developed leg edema, and deep vein thrombosis was diagnosed by duplex sonography. This occurred even while the patient was being treated with low-molecular-weight heparin. At that time, we investigated 29 patients, including this one, with a high BMI and signs and symptoms of heart failure. We showed that a high BMI was associated with a significant pressure gradient between the thoracic and abdominal vena cava.4Furthermore, obesity is reported to be associated with raised intra-abdominal pressure and reduced venous blood flow velocity, which can increase the risk of thrombus formation.5 As in the other patients, right heart catheterization was performed. After determination of right atrial pressure, the Swan-Ganz catheter was pulled back into the vena cava inferior and a significant pressure–gradient between the thoracic and abdominal vena cava was found. Because of this, we argued that patients could benefit from prolonged anticoagulation or even bariatric surgery to protect them from such complications. The patient reported herein underwent bariatric surgery with sleeve gastrectomy. Postoperatively, he lost 65 kg over 20 months. He was seen again in our clinic for cardiovascular work-up prior to cosmetic body lift surgery, and his body habitus had changed markedly (Figure, B). Pedal edema had completely resolved and exercise tolerance was greatly improved. On the second admission, we repeated right heart catheterization as 2 years prior. After recording the right atrial pressure, the catheter was pulled back into the inferior vena cava under continuous pressure recording. 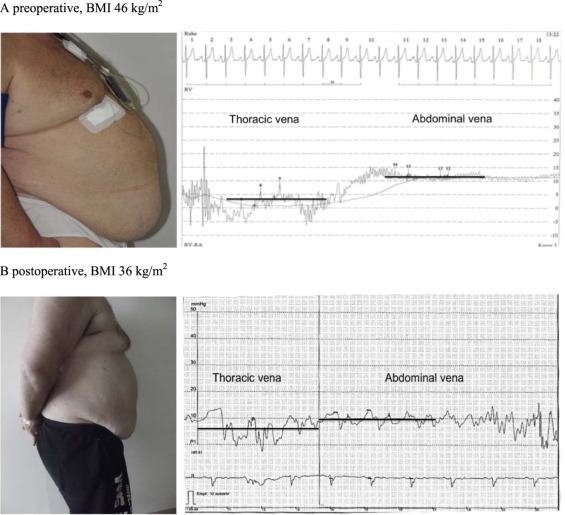 Compared with the investigation prior to bariatric surgery (Figure, A), the pressure gradient between the thoracic and abdominal vena cava disappeared (preoperative 9 mm Hg, postoperative 0-2 mm Hg) (Figure, B). After bariatric surgery, weight loss, and pressure gradient reduction, there were no signs and symptoms of heart failure, and peripheral venous congestion completely disappeared. Patients with obesity presenting with peripheral edema in the absence of heart failure, with a history of deep vein thrombosis without other obvious cause, should be evaluated for vena cava compression, and bariatric surgery may be considered.